1. Heat little ghee in a pan and fry the rava. 2. Combine milk and water in a bowl. 3. Add the rava and allow it to boil. 4. Lightly fry the cashews, raisins and cardamom in little ghee. 5. Add this to the rava mixture. 6. 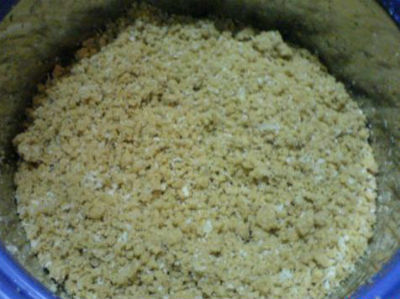 Make a thick syrup of the jaggery (vella pagu) and add the rava mixture. 7. Stir to mix well and allow to cool. 8. Once cooled, the mixture should separate into small lumps. Feel free to comment or share your thoughts on this Rangoon Puttu Recipe from Awesome Cuisine.